African Fish-Eagle ( Haliaeetus vocifer fam. Accipitridae) Kruger Park Birds & Birding. 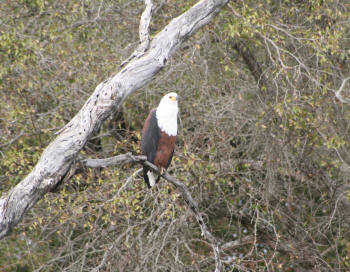 The African Fish-Eagle (Latin name Haliaeetus vocifer) is described in Roberts Birds of Southern Africa, 7th Edition. This bird has a unique Roberts number of 148 and you will find a full description of this bird on page 481 also a picture of the African Fish-Eagle on page 481. The African Fish-Eagle belongs to the family of birds classified as Accipitridae. According to the Percy FitzPatrick Institute of African Ornithology the African Fish-Eagle is also known by these other names: Fish Eagle, West African Fish-Eagle, River Eagle. The African Fish-Eagle is neither Endemic or near Endemic to the Kruger National Park. It is a common resident and one of my favourite birds. It has a piercing and awesome cry unmistakable once heard. I've never been fortunate enough to see an actual catch of fish which is something I would dearly love to witness. The eagle with its white head and neck is hard to mistake even when flying. The African Fish-Eagle can be seen throughout the Kruger favouring the larger rivers and large bankside trees for roosting. The African Fish-Eagle feeds in or around water mainly and eats fish and other aquatic animals. You will normally see the African Fish-Eagle in pairs.